Is it possible to have a strip of cold climate in the middle of a planet? Would it be possible to have a region on a planet that is not near its poles that has below freezing temperatures most of the year, while having more temperate regions both above and below it? If so how? Would the sun have to do a weird? Would the planet need to be an odd shape? Is it just impossible? Also, the planet is going to be lower mass than earth, and and needs to have a stable climate capable of sustaining conventional life in the temperate regions. As Raditz_35 points out in comments, mountains - even equatorial ones - are colder at higher altitudes. For instance, Mt. Kilimanjaro is only three degrees off the equator, but its summit is cold enough to host glaciers. But what you want isn't just one mountain, it's a whole ring of them, mostly along the equator. Enter Iapetus, the eighth moon of Saturn and the third-largest. Among Iapetus's features is a pronounced ridge of mountains, some as much as 20 kilometers high, and over 1300 km long (longer if one takes into account isolated peaks that fall along the same line in both directions). This ring follows the Iapetian equator for no clearly-defined reason. It may be a remnant of some earlier phase of planet formation, such as former planetary rings, or it may have been caused by Saturn's gravity as the moon cooled. It might even have formed through the same natural buoyant forces that cause continents on Earth. Whatever the case, if Iapetus had an Earthlike climate on its plains (and I must stress that it absolutely doesn't) the ridges would be frozen solid for most of their height. Obviously you'll want your equatorial ridge to be a smidge less pronounced. You can do it with elevation. 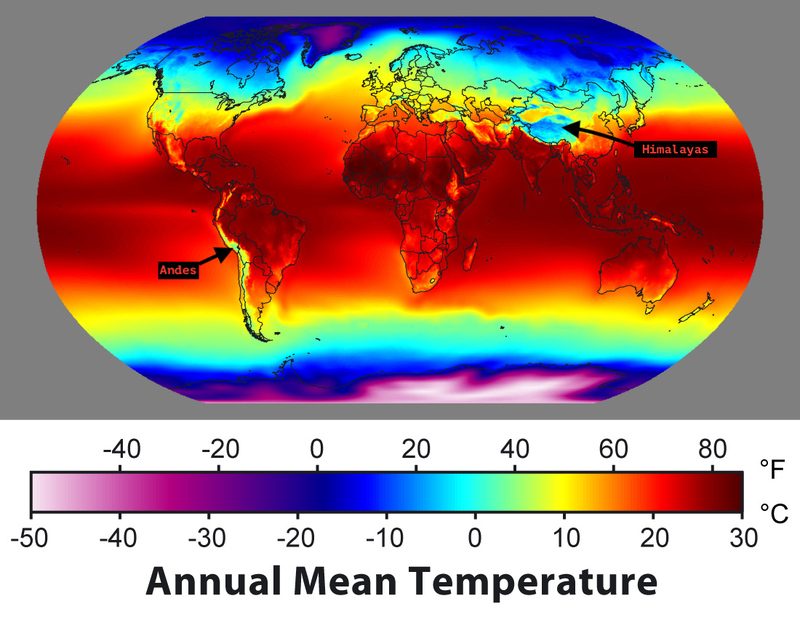 Here is a map of average temperature on Earth. I have labeled the Andes and the Himalayas. They are high elevation areas and you can see they are substantially cooler than adjacent areas at the same latitude (same distance from the equator). The Himalayas are more a patch than a strip but otherwise are exactly /a region on a planet that is not near its poles that has below freezing temperatures most of the year, while having more temperate regions both above and below it/. You could accentuate this. Make a high mountain range where you need it to be cold. It does not need to be steep mountains - it could be a high plateau. The higher it is, the colder it is. Depending on it's directionality, a planet whose spin (like Uranus') is perpendicular to it's sun, the the north/south poles would be more temperate than it's equator. In other words, if you "flipped" the earth such that the equator was rotating at a different angle relative to the sun, then the poles would be more temperate with a different climate at the equator - whether hotter or colder. Imagine a world at the L5 point between a binary star system, with it's rotational axis pointing at the suns. This planet's coolest area would be the belt around the middle. Maybe perpetual darkness via an extremely dense ring of asteroids around the planet. Because it is always dark and receives very little light (energy) it gets very very cold. Could be that this is enough to give you freezing temperatures. As others have mentioned, altitude would be your answer. Since that's already established, I'm going to suggest a couple ways a tall ring around the equator could be accomplished. In the early days of the planet forming, another planet of a similar (small) size was forming as well in the neighborhood and while they were both still semi-molten, they bumped into each and stuck together. This could have left a raised band between the formerly two planetoids as they smashed together. How uniform or weathered this ring is is up to you. As we know, the Earth bulges slightly around the equator, due to it's spin. Again, before your planet fully solidified, it had an abnormally high rate of spin, causing the bulge to be more pronounced than normal with it ending up as tall as terrestrial mountains. Whether it still has that high spin is up to you. The high spin rate would probably have a more uniform ring, but a non-uniform ring could have valleys and holes/caves that could allow easier travel between the hemispheres. Your planet is an odd one: It has no axial tilt and no seasons. In old days, in the time of magicians, they wrought the Bridge of the World to feed their lust for power. Six great towers to the sky were created (beanstalks) and they became the pylons for the Bridge. 6 beanstalks. From there, you build a ring city around the earth over the equator. This city could easily expand to be quite wide -- 20-100 miles which would create a permanent shadow band along the equator. It would much like the temperature drop that comes with a solar eclipse, but it would keep going. At some point the temperature is balanced by cold air settling and rushing out from the Shadow Lands, and warm air rushing in. I don't know how effective the circulation would be. For an inverse real world effect look on Willk's global temperature map at the nice warm (yellowish) streak going up the West side of the Bristish Isles and far to the North. This is caused by the Gulf Stream carrying warm water northwards and the Atlantic Conveyor carrying the cold water back below it for reheating. Without this I'm told that the British Isles would be permanently ice-locked. I'm not sure that's true but they would certainly not be the balmy sunny subtropical place they now are. Hey! Wait .. :-). Drop the British Isles into the Southern Ocean at correct latitude and it lies wholly below NZ (bottom right on the map) - and Invercargill, at the bottom of NZ, is not known for its halcyon winters. The prevailing surface winds at the equator are due west (balanced by high level jet streams off the equator blowing due east.) With active volcano(s) at the equator, the fallout would be carried due west and under the right circumstances might create a band of cool at the surface. It's also worth noting that peak (as opposed to average) annual temperatures are highest a little off the equator. For example in Africa peak temperatures occur not at the equator but in the deserts of the Sahara and southern Africa. As @Willk pointed out, you just need altitude. Now the question is: How do you get that altitude in a band around the equator. You could figure that with plate tectonics moving things around, for a brief time (in a geological sense), mountain range could line up on or near the equator. Another, more believable, solution is to have a super earth with a high rate of spin. This planet will tend to bulge out at the equator. If the bulge is significant enough, it will get large enough for there to be a difference in the perceived gravity between the pole and the equator. This would allow mountains to grow higher on the equator. Look at Mission of Gravity by Hal Clement as an extreme example of this type of world. Not the answer you're looking for? Browse other questions tagged science-based planets climate or ask your own question. Is it possible to have a planet that has seasons and is also cold at the equator and hot both poles? What would a planet spinning fast enough to allow geostationary orbit near the surface look like? Could a cold planet (tundra) develop and maintain a breathable atmosphere for humans? What is the expected terrain for an arid highly eccentric Earth-like planet? ELEVEN Inner Planets?! What Will the Ice Ages Be Like? Is planet similar to Crematoria possible in real life? What rough climate and/or biome classifications would I assign to a planet with 31.1 degrees axial tilt?